With five provincial ridings up for grabs last Thursday night, Ontario’s Progressive Conservatives are wondering just what went wrong. Garnering only one of the ridings – with Toronto Councillor Doug Holyday carrying the Etobicoke Lakeshore riding – with two apiece going to the governing Liberals and the NDP, some PCs – including Newmarket-Aurora MPP Frank Klees – say a leadership review of Tim Hudak will be a positive step in the right direction. Despite efforts leading up to last week’s by-elections, party message was lost in the shuffle, says Mr. Klees. It is a common refrain, and one which was heard in the 2011 provincial election, but Mr. Klees says it is going to “take some time” to get all the analysis in place on what exactly went wrong. “We have no one to blame but ourselves which is why, over the next couple of weeks, we have a responsibility to get that feedback from not only our party members but also the general public,” says Mr. Klees, noting a caucus meeting scheduled for the end of the month. There, MPPs will be providing feedback from themselves and their constituents to Mr. Hudak, and then the next step will be up to him. “I will provide that information to the leader and it will be up to him to determine what he does, not only with the information I give him and the advice that I provide, but also the advice that will no doubt be coming from my other caucus colleagues,” he says. It is unlikely there is a Progressive Conservative in all of Ontario who does not share similar concerns about just what went wrong last week, he adds, particularly making stronger inroads into the ridings that were up for grabs. Information collected over the next few weeks will be “cumulative,” and Mr. Hudak has a “responsibility” to listen carefully “and understand this is not about any individual” but rather what is best for the province. “I think we have to take this a step at a time,” says Mr. Klees on a potential leadership review. “I believe at the end of the day…there is an option for [Mr. Hudak] to voluntarily ask the provincial executive to schedule a vote of confidence at the upcoming convention. I believe that would be a very positive step because it gives the leader the opportunity to put to rest any negatives if, in fact, he comes out of it with a solid confidence vote. Mr. Klees was first elected to the Ontario Legislature in 1995. Since that time, he has served as cabinet minister under a number of different portfolios. In 2004, after Premier Ernie Eves stepped down, he faced off against John Tory and Jim Flaherty for party leadership, a race ultimately won by John Tory. 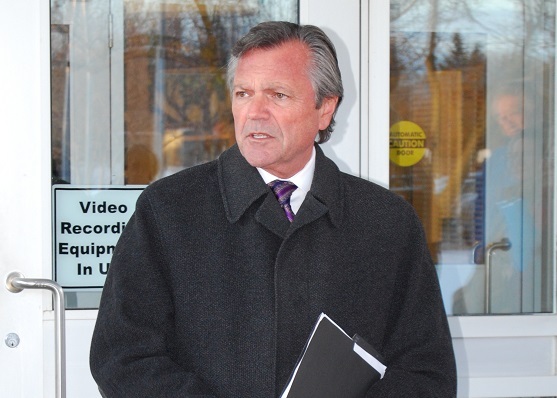 He took a second kick at the can in 2009, ultimately coming in second place to Tim Hudak. As long as there is a party leader, Mr. Klees refuses to discuss “what may or could be” and he has, as a member of the caucus, the responsibility to maintain loyalty to Mr. Hudak. Looking ahead, Mr. Klees says the Progressive Conservatives “have to be very clear” about decision- making as a government. Accountability and transparency is what Ontarians want “more than any other promises”, he adds. In the meantime, with two new caucus members, Mr. Klees says he believes a key to their success will always address the needs of their constituents and everything else will fall into place. Top priorities should be access to healthcare and long-term care, unemployment, and particularly employment opportunities for youth.